EASY DUPLICATE FINDERscan, remove, save space. I'm updating to Windows 10. Will your software continue to work? I think I have a lot of duplicates. Is Easy Duplicate Finder the right program to deal with them? 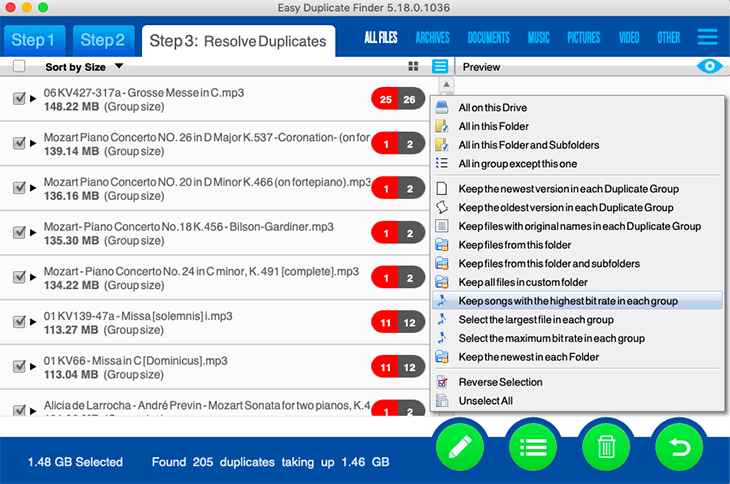 If you want to find and remove exact duplicates, then Easy Duplicate Finder is for you. With the help of this program you will be able to manage duplicate documents, photos, songs, videos, emails and more. There are lots of different options and scan methods that guarantee accurate results and make the search quick and easy. However, if you are looking for a program to manage your photos, we suggest that you try Duplicate Photo Cleaner alongside Easy Duplicate Finder. 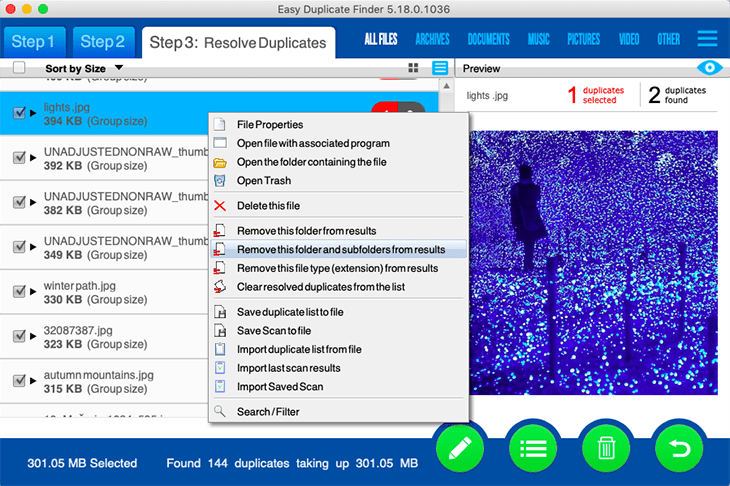 While Easy Duplicate Finder is great for finding exact copies of your photos, Duplicate Photo Cleaner can detect similar images of the same subject. This feature is ideal for those who have a large image library and want to get rid of poor quality shots quickly. What is the best way to scan my computer for duplicate files? Open Easy Duplicate Finder and drop some folders you want to scan into the "Drop Folders Here to Scan" area. You can also click on "Add folders" and select folders without dragging and dropping. Click on the green Start Scan button to start the scan. 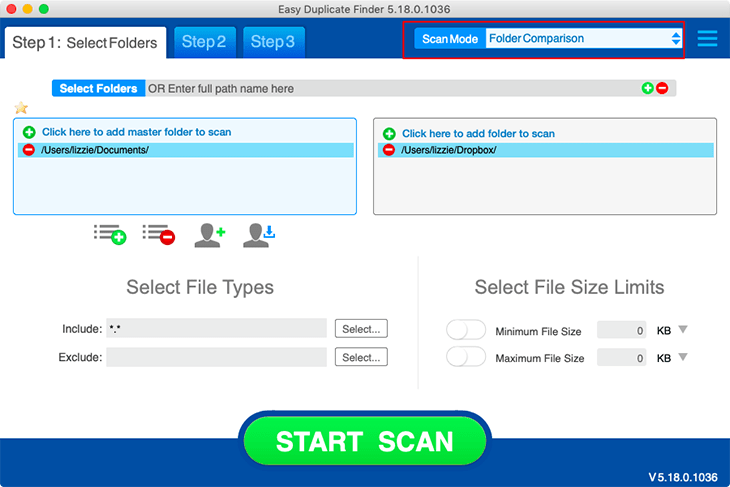 When Easy Duplicate Finder finishes the scan, you can click on the "Go Fix Them!" button to examine the scan results. Click on "Manage Duplicates" and select "Delete Selected", then tell the program to put the duplicates in the Recycle Bin or Trash. If you don't want to examine the scan results and prefer to let Easy Duplicate Finder delete duplicates automatically, click on the "Remove All Now" link under the "Go Fix Them" button. In what languages is Easy Duplicate Finder available? Easy Duplicate Finder is available in English, German, Portuguese, Spanish, French, Italian, Turkish, Japanese, Chinese (Simplified), Ukrainian and Russian. Where can I download a portable version of Easy Duplicate Finder? At this time we don't offer a portable version of Easy Duplicate Finder. What is the difference between Easy Duplicate Finder and Duplicate Photo Cleaner? Both Easy Duplicate Finder and Duplicate Photo Cleaner are designed to find and delete duplicate files. The main difference between these two apps is that Easy Duplicate Finder works with duplicates of all file types, whereas Duplicate Photo Cleaner works with images only. In addition to that, Easy Duplicate Finder can only find exact duplicates. Duplicate Photo Cleaner is different because it can detect both identical and similar images, such as resized and edited photos. It can also find photos in different formats (a .JPG file vs. a .PNG file, for example). If you are having trouble choosing between Easy Duplicate Finder and Duplicate Photo Cleaner, ask yourself what types of duplicates you want to find. Easy Duplicate Finder is ideal if you want to delete duplicate documents, songs, photos, emails and videos from your computer. But if all you want to do is organize your extensive image library, consider getting Duplicate Photo Cleaner. It will not only help you find and delete duplicate photos, but also let you easily sort through similar shots and decide which ones to keep and which to delete or move. How does Easy Duplicate Finder find duplicates and pre-select the files to delete? Easy Duplicate Finder's File Search mode uses the SHA256 algorithm to compare files. This algorithm compares the hash for each file. If several files have the same hash, then one file is considered an original and the rest are marked as duplicates. EDF scans the folders specified by the user and compiles a list of files. If the user applied any filters (size, file extension, etc. ), the files from the list are filtered according to that. Once the results have been filtered, EDF calculates the SHA256 hash for each file. Files that have the same hash are duplicates. EDF groups the duplicates and assigns numbers to the files starting with #1, then it sorts the results. The file that was assigned with #1 is considered the original and the rest are considered duplicates. Because the files are the same (they have the same hash), the File Search mode selects the original file randomly. You can always modify the selection with the help of the pencil button. For example, you can mark the oldest or the newest files as originals. There are lots of batch selection options, so make sure you check them out. How do I install Easy Duplicate Finder on a Mac? When you open Easy Duplicate Finder for the first time, your Mac may ask you if you are sure you want to open Easy Duplicate Finder. Click Open to launch the app. How does Easy Duplicate Finder decide which files are the originals and which are the duplicates? When you are using most scan modes, Easy Duplicate Finder treats the first file in a group of duplicates as the original file. But when you switch to the Folder Comparison mode, all the files in the Master Folder are marked as the originals and the files in target folders are marked as the duplicates. I've just installed Easy Duplicate Finder on my Mac and I'm getting lots of security pop-ups. Why is that? Open System Preferences, go to Security & Privacy, click on the padlock icon, and enter your system password to be able to make changes to the settings. Drag & drop Easy Duplicate Finder from the Applications folder to the "Allow" window or click on the "+" sign, browse to EDF, and grant it full disk access. What are the trial version limitations? Easy Duplicate Finder's trial version provides unlimited scanning and lets you manage 10 groups of duplicate files. After that, file management options become locked and the scanning remains available. I'm trying to register Easy Duplicate Finder, but it's not working. Can you help? Your UAC (User Account Control) settings in Windows Vista, Windows 7, Windows 8 and Windows 10. When that's the case, simply close Easy Duplicate Finder, then right-click on its shortcut on your desktop and select "Run as administrator". Then proceed to register the program. Your firewall or anti-virus programs may be preventing changes to your computer. Even ones you want to make such as registering your product. Try disabling your security software temporarily and proceed with product registration. My computer is not connected to the Internet. Is there a way to activate Easy Duplicate Finder offline? Purchase a license key and install Easy Duplicate Finder on your computer. Open Easy Duplicate Finder, click on the hamburger menu and go to "About". Copy the product key from the popup that appears. Go to this page and open a support ticket. Make sure you send both your product key and your license key to the Support Team. Our Support Team will generate activation data for your copy of Easy Duplicate Finder and email it to you. Copy the activation data from the email, save it as a text file and put the file on a flash drive. Connect the flash drive to your offline computer, open the text file with the activation data, select all of it and copy it. Important: don't paste it anywhere at this point! Open Easy Duplicate Finder. If you have valid activation data and if you've followed these steps correctly, your copy of Easy Duplicate Finder will become activated. If you're on Windows, you can ask the Support Team to email you a Master File that you can save to the folder where Easy Duplicate Finder is installed. Then simply open Easy Duplicate Finder and it will get activated. I want to install Easy Duplicate Finder on my new computer using my license key. How do I do that? If you ever need to reinstall the software or move it to a different computer, you can go to the "About" screen inside the program, make a note of your license key and then remove it. This will reset the key so that you can reactivate it on a new installation (this feature is limited to 3 times). Note: if your license key has expired, please visit the What's New page on the site and download the version that was released before your key expired. An expired key will not activate on any version released after expiration. How do I upgrade to the latest version of Easy Duplicate Finder? If you are a registered (licensed) user, simply click on the Check for Updates link and download the latest version. Then launch the installation file and follow the prompts. You don't need to uninstall the old version to upgrade. Why is there an expiration date on my Easy Duplicate Finder license? When you purchase a license for Easy Duplicate Finder, the license unlocks the program forever, so that you can use Easy Duplicate Finder for as long as you want. As for the expiry date, it's set to show you the period during which you will be able to download free updates. Once the license expires, you can continue using your version of the program, but you will need to extend your license to continue getting updates and have access to email support. Remember that each computer is assigned a unique license ID. Once activated, the software will not work on any other computer unless you either remove the key using the About section of Easy Duplicate Finder or ask our Support Team to transfer your license. My system crashed and Easy Duplicate Finder got unregistered. How do I get my software up and running again? Install Easy Duplicate Finder again, just as if you were installing it on a new computer. When prompted, enter your current license key and proceed to activation. The activation will fail and you'll get an option to activate the software by email. Click on "Activate by email" and fill out the details including why the reactivation is necessary. Submit the email. We will reactivate your license key and you'll be able to use it to activate the software again. I thought I had purchased a license for 3 computers, but it looks like I've purchased a single-PC license. Is there any way to upgrade my license for the price difference between the two? Please log into your account from this page. To the right of your license key, you'll see two links - to renew and to upgrade. Click on the Upgrade button and follow the prompts. How do I log into my account on easyduplicatefinder.com? You can log into your Easy Duplicate Finder account here. Use your account to retrieve your license key and check your subscription. Your login ID is the email address you used when you purchased the program. Also keep in mind that passwords are case-sensitive. I still use Windows XP on my computer. Is Easy Duplicate Finder compatible with it? Does Easy Duplicate Finder work with network drives? Easy Duplicate Finder should work on any network device as long as there is a drive letter assigned to it and the device is not a wireless one. Does Easy Duplicate Finder offer different options for viewing the duplicates at Step 3? Yes, there are two options: the new duplicate groups view and the classic table view. To switch between views, simply click on the active view icon to switch it off and use the other option. How can I make sure the program doesn't delete files that are not duplicates by mistake? Sometime when you are searching for duplicate files by name or date only, the software can mark some files as duplicates by mistake. To prevent this from happening, use a more advance file comparison method, such as CRC Checksum. And if you want 100% accurate results, go to Easy Duplicate Finder settings and select byte-by-byte comparison. This scanning method will compare every single byte of the two or more files and will only mark files that are exactly the same as duplicates. How do I search for duplicate files in just one folder? When you use Easy Duplicate Finder to search for duplicate files, you don't have to scan your whole hard drive. Simply drag & drop the folders you want to scan into the Include to Scan area and launch the search. When the scan is complete, use Assistant to quickly select the duplicate you want to move, rename or delete. Does Easy Duplicate Finder find files shared with me on Google Drive when I use the Google Drive scan mode? No, it doesn't. In Google Drive scan mode Easy Duplicate Finder scans files and folders stored on your Google Drive only, i.e. files created by you. Folders that were shared with you are NOT stored on your Google Drive even though you can access them through your Drive. Because these files don't occupy any space under your account, Easy Duplicate Finder doesn't scan them. If you want to scan all the files on your Google Drive including the files that were shared with you, then it's better to install Google Drive on your computer, sync files and search for duplicates in the Google Drive folder locally. When you delete the duplicates, all changes will be synced with Google Drive in the Cloud. How do I check which duplicates are pre-selected at Step 3 and modify the selection? You can expand each duplicate group by clicking on the small arrow next to the checkbox and see which files have been selected automatically. If you are not happy with Easy Duplicate Finder's selection, simply check the checkbox next to a different file. To modify the selection for all the duplicates in bulk, click on the green button with a pencil icon and select the option that works best for you. How do I sort duplicates by folder if I want to keep files in a particular folder? You can adjust the bulk selection to keep files located in a particular folder or in a folder plus its subfolders. To do that, go to the Step 3 screen and click on any file located in the folder you have original files. Then click on the button with a pencil icon and select "Keep files from this folder" or "Keep files from this folder and subfolders". How do I use the "Music Tags" mode to find duplicate songs? As the Scan Mode, select Compare Music Tags. Go to Settings to select the tags you want to compare songs by (title, artist, etc.). Select the folders where you want to look for duplicate songs and click Start. When the scan is complete, go through the search results and select the songs you wish to move or delete. Tip: double-click any song to preview it. This will save you from accidentally deleting a song you may want to keep. Does EDF's Music Scan mode offer a way for me to delete low-quality duplicates songs in bulk? The Music Scan mode lets you batch-select duplicate songs with the highest or lowest bitrate. The higher the bitrate, the better the sound quality is. If you want to delete low-quality duplicate music files from your computer, go to Step 3, click on the pencil icon button, and choose the "Keep the songs with the highest bitrate in each group" option. Then click on the trash can button and EDF will delete the low-quality duplicates and keep only the high-quality tracks. How do I configure Easy Duplicate Finder to sync with my iTunes/iPhoto/Windows Media Player library? If you want Easy Duplicate Finder� to not only delete duplicate songs but also sync your iTunes/iPhoto/Windows Media Player library, you'll need to enable the relevant sync option. To do that, click on Settings (Preferences on Mac), go to the File Search tab and select the "Show duplicate in media libraries" checkbox. Click OK to save the new settings. I've scanned some folders for duplicates and got lots of results. Now I want to make sure I don't delete files from a specific folder and its subfolders. How do I do that? When you go to Step 3 to examine the scan results, right-click on any file in the folder you want to exclude from deletion and select "Remove this folder and subfolders from results". This way you can be sure you won't delete files located in the folder by mistake. Is there a way to use Easy Duplicate Finder to compare files against files in a specific folder? Or compare files in Folder A against files in Folder B? Yes, Easy Duplicate Finder has a mode called Folder Comparison, which you can find in the scan modes drop-down menu. This mode allows you to run very specific scans and find duplicates in specified folders only. When you use the Folder Comparison Mode, Easy Duplicate Finder asks you to select a Master Folder - a folder the program will use to compare other folders with. After you select the Master Folder, add some Target Folders to the second drag & drop area to specify where Easy Duplicate Finder should look for duplicates. When done, perform a scan the usual way. Note that only the specified Target Folders will be scanned. What exactly does the Folder Comparison scan mode do? The Folder Comparison mode is a special scan mode that makes it easy to compare files in two or more folders. It treats files in Source Folders as originals (master files), thus helping you to avoid any confusion when you're choosing which files to delete and which to keep. This mode is great for comparing files on external drives with files on your computer and merging folders. 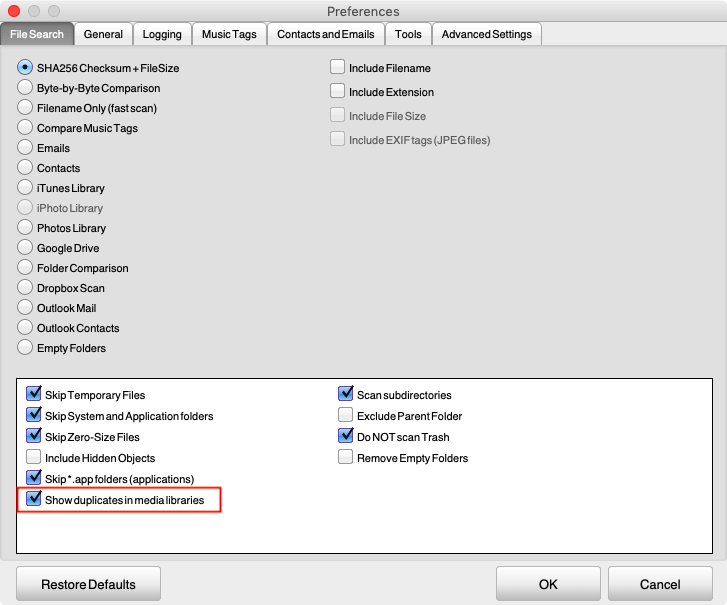 What does the "Replace with Symbolic Link" duplicates file management option do? When you open the symbolic link as you would open a file, the original file opens up. This way only one file remains, but all previous duplicate entries stay in their respective locations. Which email clients does Easy Duplicate Finder support? Easy Duplicate Finder supports Microsoft Outlook on Windows and Mac, and Mac Mail. We are planning to add support for more email clients in the near future. What's the difference between the Email Mode and the Outlook Mode? The Email Mode is designed to work with your operating system's native email client (Outlook Express in older Windows version and Mac Mail on Apple computers). The Outlook Mode has been designed specifically for managing emails and contacts in Microsoft Outlook on Windows and Mac. Which versions of Microsoft Outlook are supported? Easy Duplicate Finder supports Microsoft Outlook v15 and newer. How exactly does Easy Duplicate Finder detect duplicate emails? When Easy Duplicate Finder scans for duplicate emails using the Email Mode or the Outlook Email mode, it doesn't compare any files. Instead, it uses your messages' properties and attributes that are provided by your email client. The attributes to compare are called "Fields" and you can configure them in the program settings, on the Contacts and Emails tab. 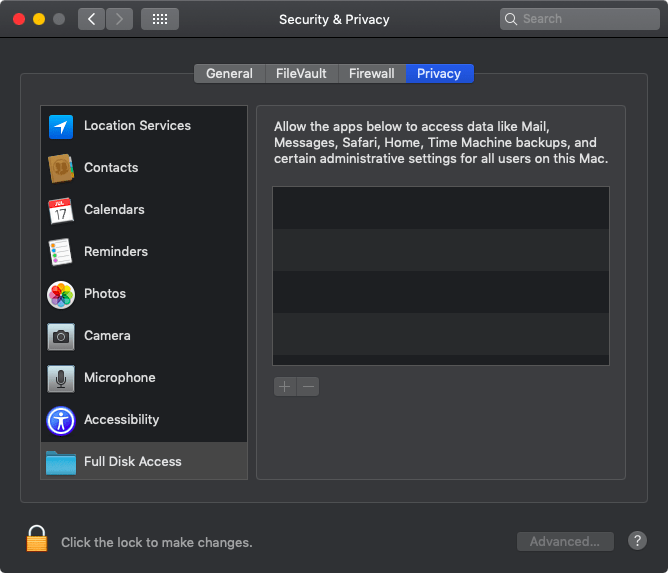 How do I scan local Outlook folders on a Mac? First, select the Outlook Email mode (Mac) from the scan modes drop-down menu. Then, go to EDF Settings and enable the option to scan local Outlook folders. Go back to the main screen and add the folders you want to scan to the INCLUDE area. Proceed with scanning as you normally would. In Contacts Scan, what's the difference between the "Merge" and "Merge and delete" options? When that's the case, you'll be offered to use either the "Merge" or the "Merge and Delete" option. Using the "Merge" option will add the missing information to Contact 1 and keep Contact 2 as is. "Merge and Delete" will add the missing information to Contact 1 and delete Contact 2. Can I use Easy Duplicate Finder to find and delete files in the Windows.old folder after upgrading to Windows 10? Type "Cleanup" in the Windows search field and then select Disk Cleanup. Click on "Clean up system files" when the disk cleanup tool loads. You'll get a screen with a list of items that can be cleaned up. Locate "Previous Windows installation(s)" and select it. Click "OK" and wait for the cleanup to finish. What is audio fingerprint music comparison technology and how do I use it? You then get results based on the track similarity in percentage (hence the adjustable similarity threshold in the Settings). 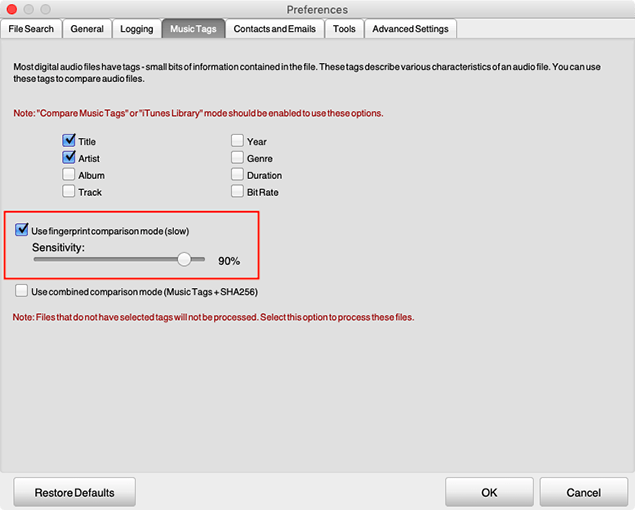 To use the audio fingerprint matching algorithm, select Music Scan from the scan modes drop-down menu, then go to Settings (Preferences on Mac), navigate to the Music Tags tab and select the "Use fingerprint comparison mode" checkbox. Then adjust the similarity threshold to fit your needs. It's set to 90% by default. After that, return to the main window and run a scan just like you normally would. My Windows computer won't let me install Easy Duplicate Finder. What to do? Your security software is interfering with the installation. Temporarily disable your security software and run Easy Duplicate Finder installer. Alternatively add Easy Duplicate Finder to the Ignore List. If that doesn't help, then your antivirus is blocking the downloading function in the installer. You can fix it by downloading the full .exe file using this link. You've downloaded the wrong version. Make sure that you've downloaded the right installation package for your operating system. 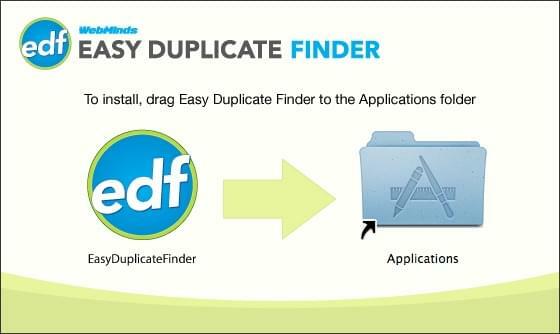 Easy Duplicate Finder is available for both Windows and Mac. You are trying to install Easy Duplicate Finder from a flash drive. Try copying the installation package to your desktop and running the installation again. UAC (User Account Control) is too restrictive. Go to the Control Panel and edit your UAC settings. I'm trying to install Easy Duplicate Finder on my Windows PC but it conflicts with another application. What to do? Some third party software (e.g. Ipswich FTP Pro) may conflict with our one-click installer. If you can't install Easy Duplicate Finder using the regular installer, try using this installation file instead. Windows 10 keeps deleting Easy Duplicate Finder whenever I download it. Why is that and how can I prevent it? Windows 10 acts like that because there is a problem with Windows Defender and it marks Easy Duplicate Finder as a false positive. We suggest that you disable Windows Defender and get a better anti-virus program, such as Avast or AVG. Once you start using a third party anti-virus, you'll be able to download and install Easy Duplicate Finder without any problems. We guaranteed that Easy Duplicate Finder is 100% malware-free. Easy Duplicate Finder isn't detecting some files that I know are duplicates. Why is that? Some files could be marked as temporary. To fix it, go to program settings and uncheck the "Skip temporary files" box. Photos: your photos may look the same, but they may have different metadata. Go to Settings and uncheck "Include EXIF tags", then repeat the scan. Music: in Settings change the scan mode to "Compare music tags". This allows you to compare the same songs that may have slightly different length and different bitrate. The default music tags under this option are Artist and Title. Perform a manual check of the suspected duplicates. To do that, go to Settings, click on the Tools tab and use the CRC calculator. This tool will manually compare two (or more) suspected duplicates for exact match. If the CRC is the same, then most likely the files are duplicates. Another reason why Easy Duplicate Finder is not seeing some files as duplicates is when they are in different formats. For example, you may have the same song saved as MP3 and as WAV. It's the same song to you, but every single duplicate finder will not display it as a duplicate because to the software it's two completely different files. However, if you search for duplicate songs by name, you will get both files displayed by Easy Duplicate Finder and will be suggested to remove one of them. Easy Duplicate Finder found lots of duplicates, but I can't delete them. Why is that? Verify that you are using the program as administrator. To do that, close the program, right-click on its shortcut on your desktop and select "Run as administrator" from the context menu. The files you are trying to delete are being used by another program. Shut down all programs except Easy Duplicate Finder and try deleting the duplicates again. UAC (User Access Control) is blocking the deletion process. Try disabling UAC or editing its sensitivity from the Control Panel, then try deleting duplicates again. Tip: try to right-click on any file in the Easy Duplicate Finder results that you want to delete. Select "Open the folder containing the file" and see if you are able to delete the file in Windows Explorer. If not, then most likely you don't have the necessary permissions from the administrator of your computer. I've accidentally deleted some files I need. What to do? Don't panic! As long as you haven't closed the program, Easy Duplicate Finder can undo the changes and bring your files back even if you've selected to delete them permanently. If you realize that you've deleted the files you still need, simply click on the Undo button that is activated as soon as you delete, rename or move the duplicates. You will be asked if you really want to undo the changes. Hit Yes and your files will be back. And if you closed Easy Duplicate Finder before you had the chance to recover accidentally deleted files, we suggest that you use a file recovery program. Why can't I select the "Keep files in this folder" option? If you haven't highlighted a file in the list, this option will not work. Click on one of the files in the list to highlight it, and then use the "Select duplicates" menu item to choose the option you need. Why are some detected files marked "Read only" and is it safe to delete them? When you scan your entire drive with Easy Duplicate Finder, you may see some files marked "Read only" in the scan results. These files are automatically write-protected by the operating system or the applications that are using them. Easy Duplicate Finder can delete read-only files, but you should not touch them unless you are absolutely sure that deleting them will not interfere with other software you may be using. I've just deleted duplicate iTunes songs, but iTunes still sees duplicate music. Why is that? This usually happens when you manually delete music files on your computer, and then open iTunes. In that case iTunes may still list those songs, even though they are actually gone. The best way to deal with this problem is use Easy Duplicate Finder to delete duplicate iTunes songs and make sure that all iTunes options are enabled in the program settings. This way Easy Duplicate Finder will sync with iTunes when it deletes duplicates on your computer and iTunes will not display false results anymore. I'm trying to scan my MP3 player with Easy Duplicate Finder and it's not working. To scan the content of you MP3 player, make sure it's connected to your computer and has a drive letter assigned to it. Unless there is a drive letter for your device, you won't be able to scan it with Easy Duplicate Finder. Sometimes even if there is a drive letter assigned to the device, the device may have restricted access to protect DMR (digital media rights). If that's the case, then your only option is to copy the music to your hard drive, delete duplicates with Easy Duplicate Finder, and replace the music on your MP3 player. I'm using the Music Scan mode and Easy Duplicate Finder is not detecting some duplicates. Why is that? The Music Scan mode compares files by their ID3 tags. If you're scanning music files that don't have any ID3 tags, the Music Scan mode won't detect them at all. Try using the File Search scan and compare the files using the default CRC32 Checksum + File Size method or using Byte-by-Byte Comparison. You can select these methods in EDF's settings. If the songs you're scanning contain exact duplicates, Easy Duplicate Finder will detect them. I want to scan a network drive with Easy Duplicate Finder but I can't add it to the scan. What to do? You need to map the network drive with a letter for Easy Duplicate Finder to recognize it. To do that, open Windows Explorer, right-click on the network drive you want to map and select "Map network drive..." Assign a letter to the drive and then add it to Easy Duplicate Finder scan. I've updated Easy Duplicate Finder and now the program doesn't recognize my network drive. Make sure you reboot your computer after installing the update. Once you reboot, Easy Duplicate Finder will recognize all mapped network drives. I'm trying to use the Email Mode to find duplicate emails in Outlook but it's not working. What to do? Please switch to the Outlook Email scan mode using the scan modes drop-down menu and try again. The Email Mode only works with native email clients. If you're using Microsoft Outlook on your PC or Mac, you should use the Outlook Mode. I'm trying to get Easy Duplicate Finder to find PST files using the Email Mode and nothing works. You don't need to look for duplicate PST files to find and delete duplicate emails with Easy Duplicate Finder. PST is just a container on Windows OS (Mac OS doesn't use PST files at all) and our software looks for actual duplicate emails. Please make sure you're using the correct scan mode - Email Mode for your native email client (Mac Mail on Mac and Outlook Express on older Windows versions), and Outlook Mode for Microsoft Outlook on Windows and Mac. I'm using the Outlook Mode to scan for duplicate Outlook emails but Easy Duplicate Finder hangs. What to do? Sometimes Outlook may hang and cause Easy Duplicate Finder to freeze. EDF relies on Outlook to scan emails for duplicates, and thus if there's a problem with Outlook, there will also be a problem with Easy Duplicate Finder. If you determine that Outlook is causing EDF to freeze, please refer to Microsoft support. And if you think that there's a problem with Easy Duplicate Finder, please submit a support ticket. Windows XP, Window Vista, Windows 7, 8 & 10 are registered trademarks of Microsoft. Easy Duplicate Finder and Duplicate Photo Finder are trademarks of Webminds, inc.